This article is about the ceremonial county. For the historic subdivision of Yorkshire, see North Riding of Yorkshire. For other uses, see North Yorkshire (disambiguation). North Yorkshire is a non-metropolitan county (or shire county) and largest ceremonial county in England. It is located primarily in the region of Yorkshire and the Humber but partly in the region of North East England. The estimated (by ONS) population of North Yorkshire was 602,300 in mid 2016 (Not including the Unitary Districts of York, Middlesbrough, Stockton and Redcar & Cleveland). Created by the Local Government Act 1972, it covers an area of 8,654 square kilometres (3,341 sq mi), making it the largest county in England. The majority of the Yorkshire Dales and the North York Moors lie within North Yorkshire's boundaries, and around 40% of the county is covered by National Parks. The largest towns are Middlesbrough (174,700), York (152,841), Harrogate (73,576) and Scarborough (61,749); the county town, Northallerton, has a population of 16,832. The area under the control of the county council, or shire county, is divided into a number of local government districts: Craven, Hambleton, Harrogate, Richmondshire, Ryedale, Scarborough and Selby. The Department for Communities and Local Government considered reorganising North Yorkshire County Council's administrative structure by abolishing the seven district councils and the county council to create a North Yorkshire unitary authority. The changes were planned to be implemented no later than 1 April 2009. This was rejected on 25 July 2007 so the County Council and District Council structure will remain. The largest settlement in the administrative county is Harrogate, the second largest is Scarborough. Within the ceremonial county, the largest is the Middlesbrough built-up area. York is the most populous district in the ceremonial county. York, Middlesbrough and Redcar and Cleveland are unitary authority boroughs which form part of the ceremonial county for various functions such as the Lord Lieutenant of North Yorkshire, but do not come under county council control. Uniquely for a district in England, Stockton-on-Tees is split between North Yorkshire and County Durham for this purpose. Middlesbrough, Stockton-on-Tees, and Redcar and Cleveland boroughs form part of the North East England region. The ceremonial county area, including the unitary authorities, borders East Riding of Yorkshire to the east/south east, South Yorkshire to the south, West Yorkshire to the west/south west, Lancashire to the west, Cumbria to the north west and County Durham to the north, with the North Sea to the east. The geology of North Yorkshire is closely reflected in its landscape. Within the county are the North York Moors and most of the Yorkshire Dales; two of eleven areas of countryside within England and Wales to be officially designated as national parks. Between the North York Moors in the east and the Pennine Hills in the west lie the Vales of Mowbray and York. The Tees Lowlands lie to the north of the North York Moors and the Vale of Pickering lies to the south. Its eastern border is the North sea coast. The highest point is Whernside, on the Cumbrian border, at 736 metres (2,415 ft). The two major rivers in the county are the River Swale and the River Ure. The Swale and the Ure form the River Ouse which flows through York and into the Humber Estuary. The River Tees forms part of the border between North Yorkshire and County Durham and flows from upper Teesdale through Middlesbrough and Stockton and to the coast. North Yorkshire contains a small section of green belt in the south of the county, just north of Ilkley and Otley along the North and West Yorkshire borders. It extends to the east to cover small communities such as Huby, Kirkby Overblow, and Follifoot before covering the gap between the towns of Harrogate and Knaresborough, helping to keep those towns separate. The belt meets with the Yorkshire Dales National Park at its southernmost extent, and also forms a border with the Nidderdale AONB. It extends into the western area of Selby district, reaching as far as Tadcaster and Balne. The belt was first drawn up from the 1950s. The city of York has an independent surrounding belt area affording protections to several outlying settlements such as Haxby and Dunnington, and it too extends into the surrounding districts. North Yorkshire was formed on 1 April 1974 as a result of the Local Government Act 1972, and covers most of the lands of the historic North Riding, as well as the northern half of the West Riding, the northern and eastern fringes of the East Riding of Yorkshire and the former county borough of York. York became a unitary authority independent of North Yorkshire on 1 April 1996, and at the same time Middlesbrough, Redcar and Cleveland and areas of Stockton-on-Tees south of the river became part of North Yorkshire for ceremonial purposes, having been part of Cleveland from 1974 to 1996. The non-metropolitan county of North Yorkshire is administered by North Yorkshire County Council, a cabinet-style council. The full council of 72 elects a council leader, who in turn appoints up to 9 more councillors to form the executive cabinet. The cabinet is responsible for making decisions in the non-metropolitan county. The county council have their offices in the County Hall in Northallerton. Certain areas within the ceremonial county are administered independently of the county council and have their own unitary authority councils: the City of York Council, Redcar and Cleveland Borough Council, Middlesbrough Borough Council, and Stockton-on-Tees Borough Council (which is only partly in the ceremonial county, the other part being in County Durham). The county is affluent and has above average house prices. Unemployment is below average for the UK and claimants of Job Seekers Allowance is also very low compared to the rest of the UK at 2.7%. Agriculture is an important industry, as are mineral extraction and power generation. The county also has prosperous high technology, service and tourism sectors. Tourism is certainly a significant contributor to the economy. A study of visitors between 2013 to 2015 indicated that the Borough of Scarborough, including Filey, Whitby and parts of the North York Moors National Park, received 1.4m trips per year on average. A 2016 report by the National Park however, provides more impressive numbers: the park area gets 7.93 million visitors annually, generating £647m and supporting 10,900 full time equivalent jobs. In 2016, there were 3.8 million visits to the Yorkshire Dales National Park including 0.48 million who stayed at least one night. The parks service estimates that this contributed £252 million to the economy and provided 3,583 full time equivalent jobs. The wider Yorkshire Dales area received 9.7 million visitors who contributed £644 million to the economy. The North York Moors and Yorkshire Dales are among England’s best known destinations. The North Yorkshire County Council operates many small tourist information offices in rural areas. Nature or eco tourism has become an important factor. In addition to hiking, some areas attract tourists with wildlife, although the latter aspect has yet to be fully developed. The historic towns of York and Harrogate are the top tourist destinations in the geographic area. York attracts millions of visitors, some of whom may be enticed to continue northward to other areas of North Yorkshire. A 2014 report, based on 2012 data, stated that York alone receives 6.9 million visitors annually; they contribute £564 million to the economy and support over 19,000 jobs. In the 2017 CONDÉ NAST TRAVELLER survey of readers, York rated 12th among The 15 Best Cities in the UK for visitors. This is a chart of trend of regional gross value added for North Yorkshire at current basic prices with figures in millions of British Pounds Sterling. North Yorkshire LEA has a mostly comprehensive education system with 42 state schools secondary (not including sixth form colleges) and 12 independent schools. North Yorkshire has a temperate oceanic climate, like most of the UK. However, there are large climate variations within the county. The upper Pennines border on a Subarctic climate, whereas the Vale of Mowbray has an almost Semi-arid climate. Overall, with the county being situated in the east, it receives below average rainfall for the UK, but the upper Dales of the Pennines are one of the wettest parts of England, where in contrast the driest parts of the Vale of Mowbray are some of the driest areas in the UK. Summer temperatures are above average, at 22 °C, but highs can regularly reach up to 28 °C, with over 30 °C reached in heat waves. Winter temperatures are below average, with average lows of 1 °C. Snow and Fog can be expected depending on location, with the North York Moors and Pennines having snow lying for an average of between 45 and 75 days per year. Sunshine is most plentiful on the coast, receiving an average of 1650 hours a year, and reduces further west in the county, with the Pennines only receiving 1250 hours a year. The 19 largest settlements of North Yorkshire, along with Malton. Cities and county town (Northallerton) in bold, district centres in yellow. Settlements in italics lie only within the ceremonial county, not the administrative county. 1 York 198,051 City of York City Unitary Authority area population figure. York urban area population is 153,717. 2 Middlesbrough 138,400 Middlesbrough Borough Refers to the Unitary Authority area of Middlesbrough only. An ancient derelict hunting lodge in Dob Park, North Yorkshire. Places of interest in italics lie only within the ceremonial county, not the administrative county.. The County is served by BBC North East and Cumbria, and for more southerly parts of the county BBC Yorkshire. Yorkshire Television and Tyne Tees Television are also received in most areas of the County, Settle and the Western part of the Craven area is served by BBC North West and Granada Television. BBC Tees is broadcast to northern parts of the county, whist BBC Radio York is broadcast more widely. BBC Radio Leeds and Minster FM (Based in York) broadcast to southern parts of the county. Yorkshire Coast Radio serves the coastal towns of Scarborough, Whitby and FIley providing a daily local news service from studios in Scarborough. New DAB stations have recently proliferated, such as Coast & County Radio that broadcasts through 4 DAB transmitters to the whole of North Yorkshire. 56.7% of households in North Yorkshire have a DAB radio according to Ofcom. The main road through the county is the north-south A1(M) which has gradually been upgraded to motorway status since the early 1990s. The only other motorways within the county are the short A66(M) near Darlington and a small stretch of the M62 motorway close to Eggborough. The other nationally maintained trunk routes are the A168/A19, A64, the A66 and A174. The East Coast Main Line (ECML) bisects the county stopping at Northallerton, Thirsk and York. Passenger services on the ECML within the county are operated by London North Eastern Railway, TransPennine Express and Grand Central. TransPennine Express run services on the York to Scarborough Line and the Northallerton–Eaglescliffe Line (for Middlesbrough) that both branch off the ECML. Northern operate the remaining lines in the county including commuter services on the Harrogate Line, Airedale Line and York & Selby Lines, of which the former two are covered by the Metro ticketing area. Remaining branch lines operated by Northern include the Yorkshire Coast Line from Scarborough to Hull, the Hull to York Line via Selby, the Tees Valley Line from Darlington to Saltburn and the Esk Valley Line from Middlesbrough to Whitby. Last but certainly not least, the Settle-Carlisle Line runs through the west of the county with services again operated by Northern. The county suffered badly under the Beeching cuts of the 1960s. Places such as Richmond, Ripon, Tadcaster, Helmsley, Pickering and the Wensleydale communities lost their passenger services. Notable lines closed were the Scarborough and Whitby Railway, Malton and Driffield Railway and the secondary main line between Northallerton and Harrogate via Ripon. Heritage railways within North Yorkshire include the North Yorkshire Moors Railway between Pickering and Grosmont, which opened in 1973, the Derwent Valley Light Railway near York, and the Embsay and Bolton Abbey Steam Railway. The Wensleydale Railway, which started operating in 2003, runs services between Leeming Bar and Redmire along a former freight-only line. The medium-term aim is to operate into Northallerton station on the ECML once agreement can be reached with Network Rail. In the longer term the aim is to reinstate the full line west via Hawes to Garsdale on the Settle-Carlisle line. York railway station is the largest station in the county with 11 platforms and is a major tourist attraction in its own right. The station is immediately adjacent to the National Railway Museum. Long-distance coach services are operated by National Express and Megabus. Local bus service operators include Arriva Yorkshire, Harrogate Bus Company, Scarborough & District (East Yorkshire Motor Services), Yorkshire Coastliner, First York and the local Dales & District. There are no major airports in the county itself but nearby airports include Durham Tees Valley, Newcastle, Robin Hood Doncaster Sheffield and Leeds Bradford. North Yorkshire is home to several football clubs, including Middlesbrough who play in the Championship and Harrogate Town who play in the National League after finishing 2nd in the National League North 2017-18 season and were promoted via the playoffs.York City who play in The National League North and finished 11th during the 2017-18 National League season. Whitby Town FC have reached the FA cup first round seven times, and have played the likes of Hull City, Wigan and Plymouth Argyle, they currently play in the Evo-Stik Premier league. Other lower league clubs include Harrogate Railway Athletic, Northallerton Town, Pickering Town, Scarborough Athletic, Selby Town and Tadcaster Albion. Rugby union teams in the county include Middlesbrough RUFC who play their league games in Durham/Northumberland 1. York City Knights (previously York) are a rugby league team who play in the Rugby League Championship. North Yorkshire is home to many racecourses; these include Catterick Bridge, Redcar, Ripon, Thirsk and York. It also has one motor racing circuit, Croft Circuit; the circuit holds meetings of the British Touring Car Championship, British Superbike and Pickup Truck Racing race series and one Motorcycle Racing Circuit at Oliver's Mount, Scarborough. Yorkshire County Cricket Club, play a number of fixtures at North Marine Road, Scarborough. The ball game Rock-It-Ball was developed in the county. ^ "North Yorkshire County Council : Contact us". www.northyorks.gov.uk. Archived from the original on 18 April 2009. Retrieved 16 May 2009. ^ "North Yorkshire population information". North Yorkshire County Council. 30 November 2017. Archived from the original on 15 July 2018. Retrieved 15 July 2018. ^ "Middlesbrough built-up area local area report". Nomis official Labour Market statistics. 12 August 2018. Retrieved 12 August 2018. ^ "York built-up area local area report". Nomis official Labour Market statistics. 12 August 2018. Archived from the original on 12 August 2018. Retrieved 12 August 2018. ^ a b "Transport map of shire county divided into districts". North Yorkshire County Council. Archived from the original (PDF) on 7 August 2011. Retrieved 10 October 2008. ^ "New council for North Yorkshire". North Yorkshire County Council. Archived from the original on 28 September 2007. ^ "Proposals for future unitary structures: Stakeholder consultation" (PDF). Communities and Local Government. Archived (PDF) from the original on 30 October 2008. Retrieved 10 October 2008. ^ "County's unitary plan turned down". BBC News. 25 July 2007. Retrieved 3 August 2016. ^ "North Yorkshire County Council Constitution". North Yorkshire County Council. Archived from the original on 28 December 2010. Retrieved 10 May 2010. ^ "North Yorkshire population information". North Yorkshire County Council. 19 December 2013. Archived from the original on 7 August 2013. Retrieved 17 January 2014. ^ "Region's coast 'top tourist draw'". BBC News. 7 June 2016. Archived from the original on 27 September 2018. Retrieved 14 July 2018. ^ "Tourism: North York Moors National Park". Archived from the original on 30 June 2017. Retrieved 14 July 2018. ^ "Trends in tourism in the Yorkshire Dales 2010 to 2016" (PDF). Archived (PDF) from the original on 14 July 2018. Retrieved 14 July 2018. ^ "Growing the Visitor Economy of North Yorkshire's Protected Landscapes" (PDF). Archived (PDF) from the original on 15 July 2018. Retrieved 14 July 2018. ^ "North Yorkshire tourist information". North Yorkshire County Council. 9 November 2017. Archived from the original on 15 July 2018. Retrieved 14 July 2018. ^ "North Yorkshire nature tourism can boost the economy by millions of pounds, report claims". The Yorkshire Post. Archived from the original on 15 July 2018. Retrieved 14 July 2018. ^ "Tourism and Travel - Leisure, Sport & Tourism - Yorkshire Employment and Training Information". Yorkshire Graduates. Archived from the original on 15 July 2018. Retrieved 14 July 2018. ^ "Tourists spend more than £600m". BBC. 11 February 2014. Archived from the original on 12 July 2018. Retrieved 27 June 2018. ^ "Report" (PDF). VisitYork. Archived (PDF) from the original on 27 June 2018. Retrieved 27 June 2018. ^ Traveller, Condé Nast. "The best cities in the UK". www.cntraveller.com. Archived from the original on 27 June 2018. Retrieved 27 June 2018. ^ "Regional Gross Value Added" (PDF). Office for National Statistics. 21 December 2005. pp. &nbsp, 240–253. Archived from the original (PDF) on 1 December 2007. Retrieved 6 October 2008. ^ "Regional mapped climate averages". The Met Office. Archived from the original on 29 December 2010. Retrieved 27 September 2010. ^ "UK mapped climate averages". The Met Office. Archived from the original on 30 December 2010. Retrieved 27 September 2010. ^ "Temperature of −19C is new Yorkshire record". BBC News Online. BBC. 3 December 2010. Archived from the original on 6 December 2010. Retrieved 4 December 2010. ^ a b c d e f g h i j k l m n o p q r s "2011 Census – Built-up areas". ONS. Archived from the original on 21 September 2013. Retrieved 15 August 2013. Look up North Yorkshire in Wiktionary, the free dictionary. 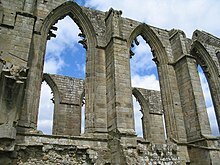 Wikimedia Commons has media related to North Yorkshire. Wikivoyage has a travel guide for North Yorkshire. This page was last edited on 16 April 2019, at 22:38 (UTC).